As Brad forecasted on his Friday post, severe storms were expected on Saturday across southwest Manitoba as a result of an upper level ridge that rounded the southern Canadian Prairies began breaking down. Scott and I decided on Friday night to head out from Winnipeg for a chase around noon on Saturday in expectation of the severe storms. We decided, as our general target area, to head south of Brandon and refine the area as the early afternoon wore on because elevated convection was ongoing in the region. As we headed down highway 2, conditions looked promising for surface based storms as there wasn’t much cloud cover near border regions. Initially we kept an eye on bubbling cumulus near Melita as we blasted west, however as we approached the so thought “elevated storms” near Souris it was evident that the storm had become surface based. Clear skies and warm temperatures south of the storm allowed the storm to ingest surface parcels as it dived southeastward. 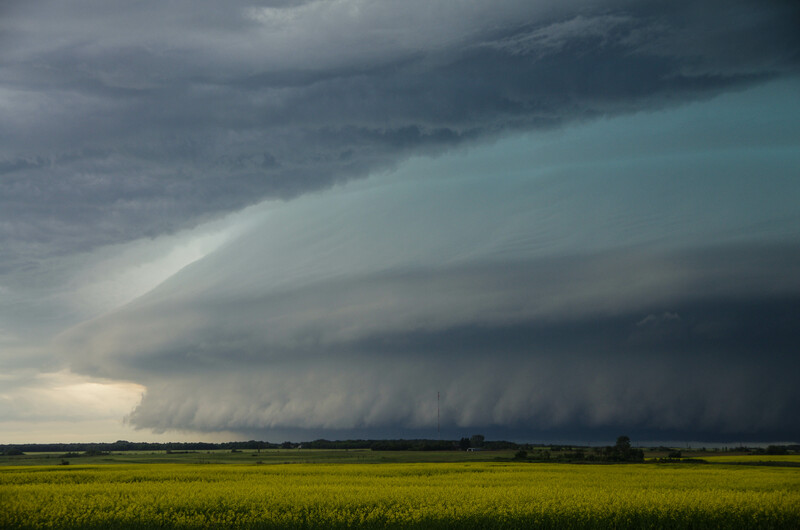 As we initially got close to the storm, we saw that the storm had a ground scraping shelf cloud – some of the best storm structure observed in southern Manitoba this year was observed west of Ninette. We continued to follow the storm in a southeasterly fashion and rotating wall clouds formed on a few occasions near Minto and Dunrea. It was also evident that the storm was producing damaging hail as the core had a greenish tinge of color. Ground-scraping shelf cloud as we initially approached the storm north of Ninette. Ongoing storms south of the border near Devils Lake spat out rain-cooled air and the supercell storm eventually began dying off near Cartright. Regardless, we continued to follow it south of the border until it eventually gusted out by late afternoon. We then looked at the weather models and saw that the next day could once again produce strong storms, this time in western North Dakota so we headed to Minot for the night. A few rotating wall clouds were observed as the supercell dove southeasterly, northwest of Killarney. On the morning of the 10th we did our analysis and looked at short term convective models only to find that there was much disagreement as to what would happen during the afternoon. Most models did convect strong storms in the Dickinson area so we headed in that direction, from Minot. Unfortunately we forgot to check for construction delays before leaving and picked a highway that had construction for over 30 km. After a scenic route through the badlands of western North Dakota, we approached our target area. Simultaneously, storms began to form to our southwest near Baker, Montana – great timing! We passed through Killdeer, North Dakota and headed to Dickinson to orient ourselves south of the storm. 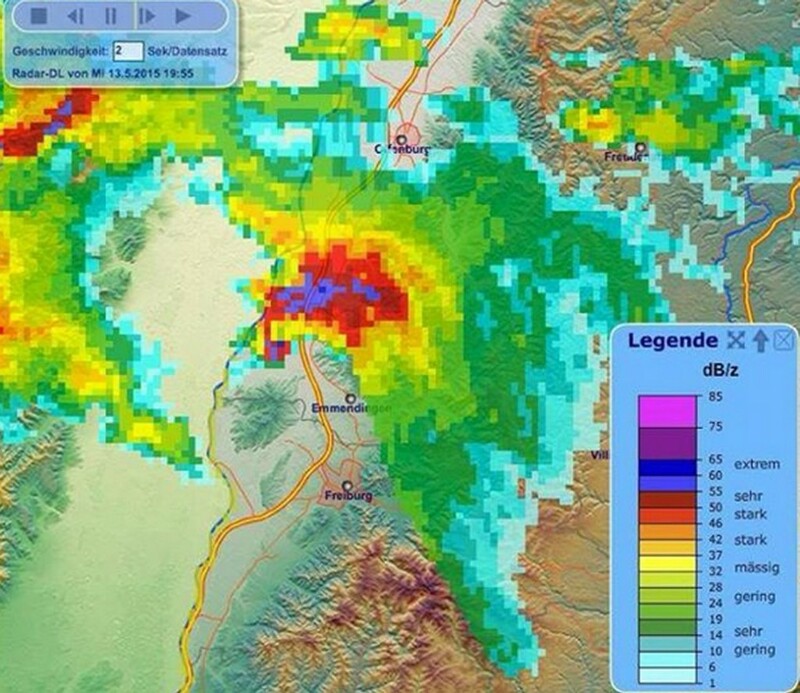 By then the storm was a full-fledged supercell. Once again it was evident that the storm was chucking very large hail. Green skies were present and the radar depicted reflectivities of over 70 dBz, we had to make sure not to get caught in the core of the storm. We first took a peek at the storm just northwest of Dickinson – this is when the storm looked best. A rotating wall cloud was observed and the storm appeared to be close to producing a tornado. Only about a half-hour or so after the wall cloud was initially observed however, the rear flank downdraft (RFD) of the storm had a mighty surge, near Killdeer. The RFD undercut the updraft portion of the storm and formed a shelf cloud – it was then evident that the storm had little tornado threat so we abandoned it. It did however have a significant wind and hail threat – Killdeer took the brunt of the storm and significant damage was observed to cars and houses. We then bailed south to a secondary cell that had formed in extreme southwest ND. Lift along the front was too strong for any significant tornado potential and storm became linear. A bow echo was taking shape. We were, however, treated to an exceptional light show on the way back to Bismarck and 90km/h winds with torrential rains as were experienced as we cored the bow echo. 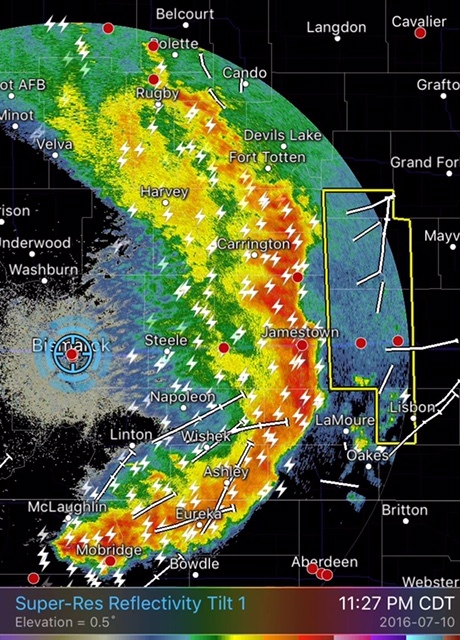 A bow echo raced across central ND as storms consolidated into a line by late evening. (Un)fortunately the tornado potential did not pan out for our two day chase trip, but overall some great storm structure and lightning was observed! Conditions were ripe overnight Friday into Saturday morning in Central Italy for severe thunderstorms – these brought very large, damaging hail to the region. A large upper level trough to the west of Italy, slowly digging eastward provided sufficient lift, as well as strong upper level winds contributing to sufficient shear being in place for severe storms. Ahead of this trough, a large area of very warm, moist air originating from the Mediterranean was present. In this warm and unstable environment, MLCAPEs of 3,000J/kg were in place which was more than enough to sustain strong updrafts. Finally, slicing into this airmass was the cold front which acted as a mechanism to trigger the storms. With all of this combined ESTOFEX (European Forecasting Storm Experiment) had issued a maximum level three watch area – meaning that there was a 15% chance of “extremely severe weather” being reported within the area of concern. This forecast definitely checked out. On Saturday morning, local time, a supercell fired over the Tyrrhenian Sea (which later evolved into a well-organized MCS) and brought with it 10-12cm diameter hail to the city of Pozzuoli Italy, located near Naples. To put this into perspective, you would need an updraft velocity speed of roughly 170km/h to suspend a hailstone of that size. Widespread damage occurred to an estimated 70,000 buildings, vehicles could be seen with major dents and blown out windshields and crops/livestock sustained major damage in the area, thankfully there were no injuries to residents reported. 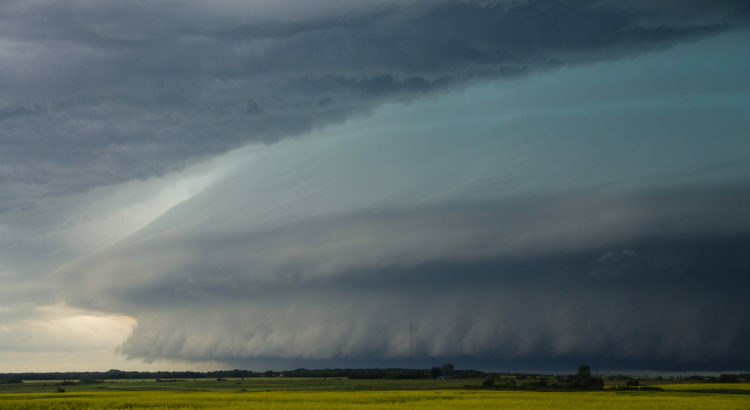 Severe storms fired across much of Alberta on Tuesday evening and Wednesday morning as well as Saskatchewan on Wednesday, and brought with them some large hail that inflicted major damage in some cities. A deep trough on the west coast of Canada was present on Tuesday and provided plenty of shear in the region to support organized storms. That, combined with some relatively high amounts of instability off the foothills of Alberta made for an environment not only supportive of organized storms, but created conditions that were prime for producing hail. In addition to these factors, the freezing level was low (just above 700mb) which meant that the hail had less time to melt before it reached the ground. In total, there were two notable severe storms that caused major damage. The first was on Tuesday evening as it initiated off the foothills and headed west and at times had supercell characteristics as it drifted east and rooted down into the boundary layer. Lacombe, Alberta took a direct hit from this storm – hen’s egg-size hail or even slightly larger was reported across town. Damage was widespread in town, with car and house windows blown out, siding shredded, and crops badly damaged. 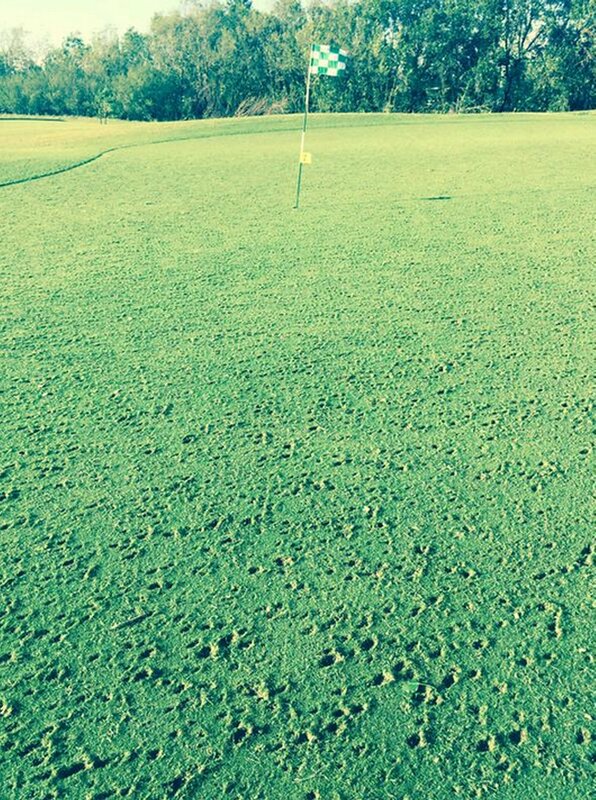 The second storm, which occurred on Wednesday in the late morning and initiated off the foothills, also dropped large hail in the Calgary area. 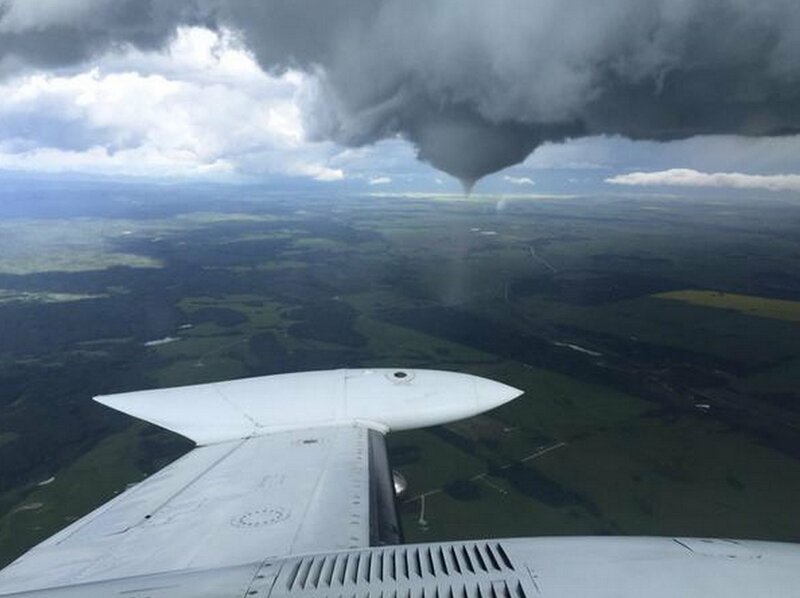 This time however, the supercell produced a rare Albertan tornado near Priddis, AB. The tornado didn’t do any significant damage to any structures (passed through a forest) but it did provide the opportunity for stunning photos. 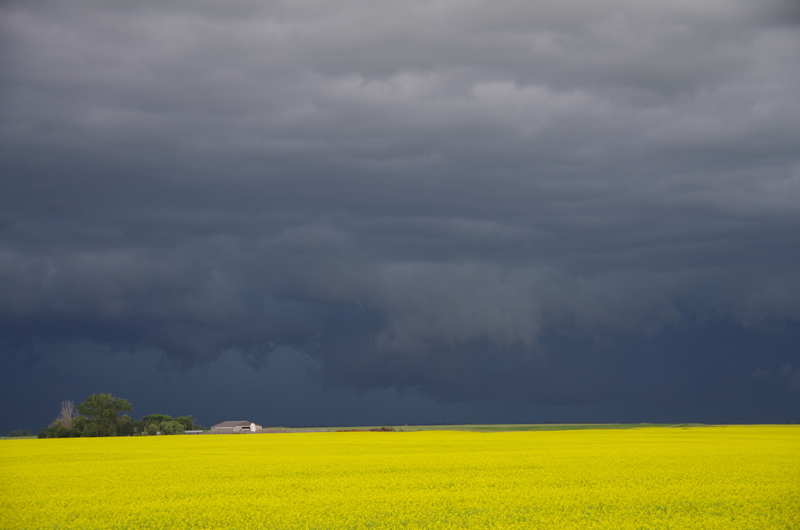 The same storm later consolidated with another storm nearby and reached central Saskatchewan by mid-evening. 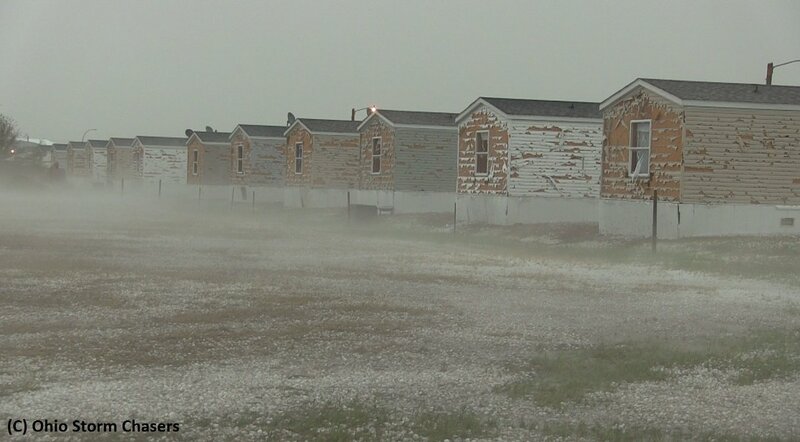 The town of Kerrobert, SK was especially hard hit with hail larger than the size of golf balls. It even prompted the town to issue a state of emergency because the damage was so severe to buildings and property – according to residents, over two thirds of the town’s houses had broken windows. Damage costs from these storms has yet to be determined but is estimated to be in the tens of millions at the very least.